John Hart, one of the signers of the Declaration of Independence, died in 1779 in Hopewell, New Jersey. 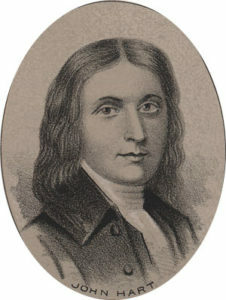 He was born around 1711 in Stonington, Connecticut, but his exact date of birth is unknown. He represented New Jersey at the signing. When the British attacked New Jersey, they placed a bounty on Hart. He was forced to hide. When he was finally able to return to his farm, he found that his wife had died and that his children had moved.